Our Cab to office is known for its unique initiatives. 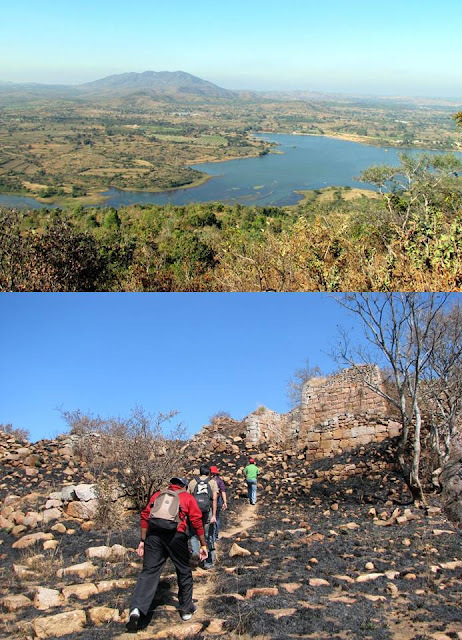 One of which has been trekking; after two exhilarating treks this was the third and I must say the group has grown. 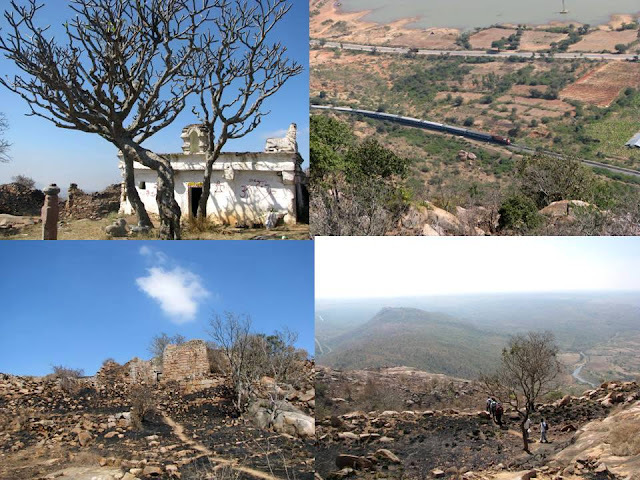 The destination this time was - Makalidurga, near Doddaballapura (12 Kms from Ghati Subramanya temple). On a nice Wednesday morning of 26th January, ten of us left Bangalore in two cars at around 6:45 AM. We met the third car at Yelahanka were our colleague V was waiting for us. We drove to Makalidurga which is a left deviation on main road that goes via village of Makalli. About two kilometers gone on the mud road, you find a parking spot on the right. We packed our breakfast and started the trek right away. Our climb was very relaxed, with light topics that created laughs. We stopped at a right place to have our breakfast to have packed chapathi’s and Saagu. We reached the summit after almost 2 hours of climb with that speed and I am sure it can be completed in 1.5 hours otherwise. View on top – A fort in ruins, but most of the stones look polished as reasonably of the recent times that the era of kings, a small temple with Shiva idol with dry flowers representing the sign of being unattended for a few days now, with Nandi rejecting the view of a hill top and devoted towards his lord, some broken idols lying here and there carelessly. On the summit we picked a best spot to view the trains wind and twist through the hills, several lakes with lorry’s being washed, a National highway with tiny little four wheelers speeding to some destination unknown to us. After a good time with more light talks at the summit, we walked back to the base which took about 1.5 Hours or may be less. Our next stop was Ghati Subramanya, which is a left deviation the way back to Bangalore from Makali. Being a holiday, the temple was extremely crowded. We had to follow a long queue that twisted and turned around the temple for 1.5 hours before we got in to the main shrine to witness a beautiful idol of Subramanya and Narasimha in the backdrop. During our wait, we witnessed several interesting characters – several wanting to break into the queue, several protesting, several giving up , many monkeys relaxing on the roof, some trying to grab the offerings and one man who thought waiting at a temple was no queue when people stocked in front of malls in city. A television set with live telecast of the main shrine; show an advanced technology influence to the old beliefs. Many worshipped the image on the television. We drove back to Doddaballapura where we had evening snacks in a hotel and then stopped by V’s house for coffee and good conversation with his mother on her travels around India and religious importance of some places around Bangalore. She stressed upon the point that whenever we visit some place we must learn the historical importance of the place and should read books on them before visiting them and then the whole visit becomes more meaningful. True. Ghati Subramanya has an interesting story. The hill was filled with several snakes and hence they were under the threat of attack by the kites, in their fear they received shelter in Narasimha who offered to establish his’ powers to prevent the attack. The Narashimha behind the Subramanya idol represents this belief. It was a very nice day with interesting short lived moments that many a times emerge out of nowhere and disappear again to nowhere after being enhanced with a laugh creating a fun moment. 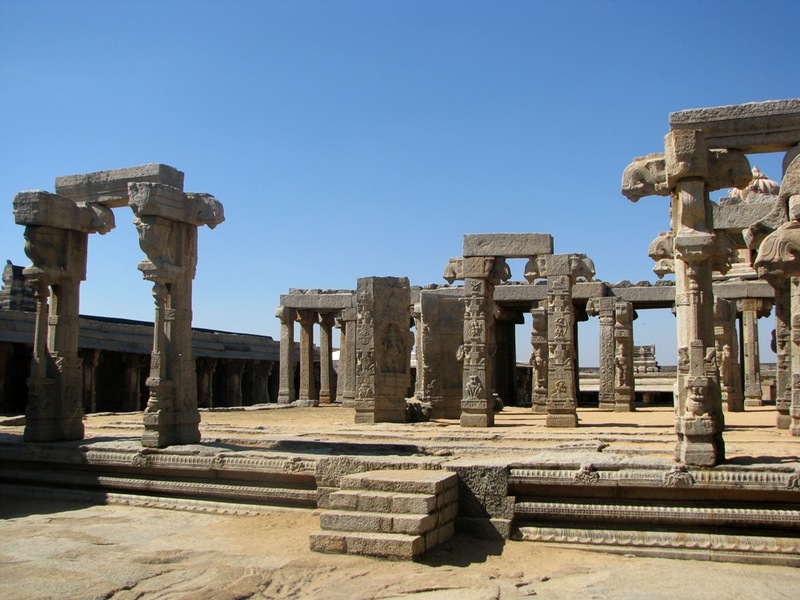 On the day of Sankranthi (Jan 15th) we (P, My In-laws, BIL and I) drove to Lepakshi. We started at around 7:30 AM and stopped at Chikkaballapura first where we had our breakfast at Kamath. After Bagepalli you cross the border to Andhra Pradesh. Here you have clear instructions to turn left towards – Lepakshi/Hindupura. 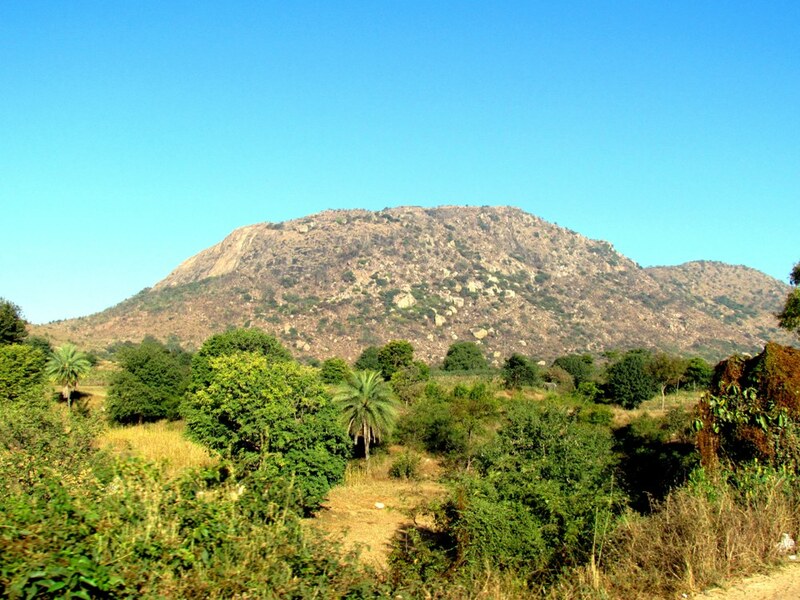 The place is about 140 Kms from Bangalore and can be easily reached in 3 hours due to good roads. 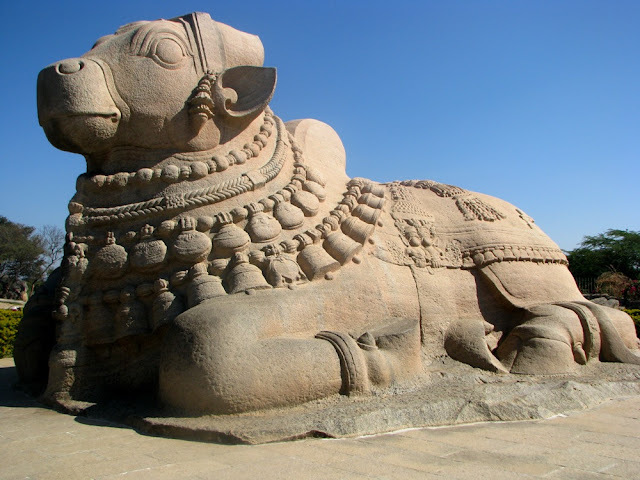 As soon as you enter Lepakshi, there stands a Nandi idol facing the hill on which the Temple is carved. The Nandi is supposed to be the third largest in India. A bunch of police constables were on a tour, so I began to capture their group and looking at my camera one of them asked – “Photo letha hein?” (Do you take pictures? ), so I answered “yes”. “Post se bejengey?” (Will you send it by post? )” Now I realized that he was referring to professional photographers who you may find in tourist locations to click pictures and send them by post. By then his friend clarified that I am a tourist like them. But to help him I said – “I could take a picture and send you by post, if you want or by email if you have an email address.” to which he denied and left. After capturing the beautifully carved Nandi, we drove to the temple. The temple is extremely well planned with several sculptures complimenting one another. What looks to be left incomplete seems to be a much planned layout of something very magnificent and ambitious, every details thriving to perfection. The dedication is simply seen if you pick one pillar and observe it completely from top to bottom. After viewing the temple with no greater background, we enquired the priest about a relative we knew. He apparently is a well known personality in this village. Owning a hotel and being a great follower of Staya Sai Baba principles, he offers free food to the poor frequently. So it was easy finding their house; interiors of which are filled with life size pictures of Sai Baba that emits ash; lumps of them, which was very surprising. The gentleman offered us another guided tour to the temple and we readily agreed as we were not satisfied with what we saw earlier with no one to clearly translate the architecture. So we walk back again to the temple this time with interesting facts about the built. Lepakshi in Telugu translates to – Le Pakshi – “Wake up, O Bird”; told by Lord Rama to the bird, Jatayu (a kite) in the place where it fell dying after its war with Ravana during its attempt to free Sita from the kidnap. It is here that Jatayu had fought bravely to save Sita, with tearing feathers it fell crashing on to the ground and it is here that it waited to inform Sri Rama of the terrible incident and here it was offered Moksha (Salvation). Yuga’s passed and around 400 years ago, a Nayaka who ruled this part of Vijaynagara Empire, named Virupanna got his dumb son cured at this place and in gratitude he wanted to build a temple for Lord Veerabadhra. He took special interest in designing the layout and it is believed that the funding to the temple was actually done by his Late father’s hidden treasure that he is believed to have disclosed in a dream to Virupanna. But as temple construction reached to almost finish, the Vijayanagara Kingdome saw some transfer of powers and the new one suspected Virupanna to have misused the dynasty treasure for his selfish purpose. It was ordered that he be blinded. Hearing this news, Virupana plucked his eyes off himself and threw it towards a wall that still has the blood stains on them. With this prior information, we walked into the temple and it seemed so different now. Written on wall, some old Kannada texts represent Vijayanagar times. 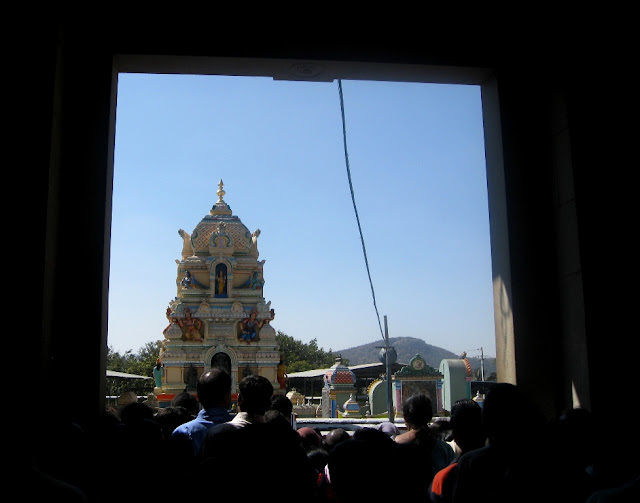 On the outer sanctum are rest areas for devotees with roofs with overhangs and cutouts to tie cradles and some idols. Carved here is a beautiful snake with a Shivalinga sitting on it and a huge Nandi outside the city built for the Shiva linga residing here on the hill. A story also goes that the mother of the sculpturer’s requested her sons to wait for lunch as she cooks and within that time the son’s built this beautiful snake, when she walked out she was surprised to see the sculpture and it is believed that her Drishti (Vision) left a crack on the idol. A nice Chauthi Ganesha is also carved on the side of this sculpture. Beautiful wedding hall is incomplete with only pillars. A foot carved on the rock is worshipped as Sita Pada. 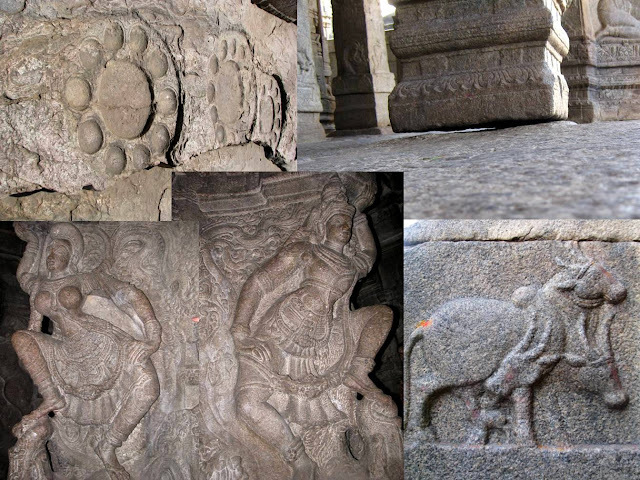 (Seeta’s foot) and some pallets are carved on the rocks formed the rest of the interiors. 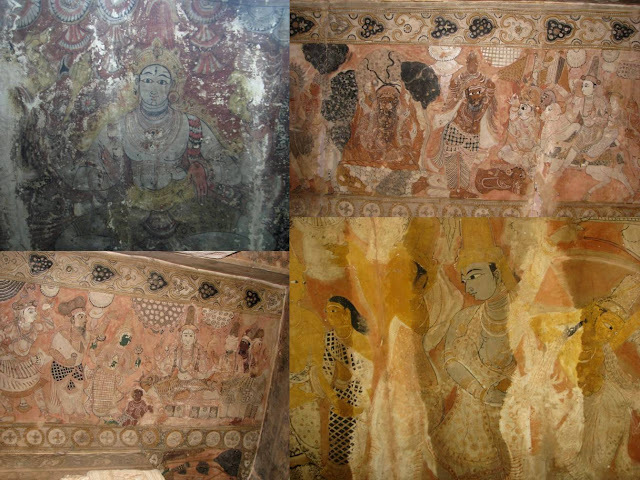 When Virupanna sacrificed his sight, all the sculpturer’s abandoned the temple work and moved away, but to complete his thoughts they painted the ceilings of the interiors with what they had in mind. Though poorly maintained the paintings still are fresh in places and depict the mogul art influence. The main shrine has a very ceiling provides itself as a huge canvas for large images of Veerabadra and Shiva. After that really informative tour around the master piece that has beauty even its incompleteness, we went back to the house and had a special lunch on the day of Sankranthi. After which, we spoke about Satya Sai Baba, who is doing several community services around the world. Also about the declaration of his day of death and reincarnation in Mandya district of Karnataka as Prema Sai. We next drove to Puttaparthi. I have been here before and well though it is not a tourist spot in spite of some long museums being an overdose of General knowledge; it’s always a good feeling to see the culture practiced around here. The devotees are very humble and always request you than demanding you to follow rules. Several devotees come here and offer their service at various days of the year. This makes me think that perhaps it’s these uncommon things that people do that make them God like. Probably it was killing of the demons or beasts and setting examples to live that made humans God like. Self realization has been common in all these people that had given them the status they today are perceived as. As far as Satya Sai baba trusts offer free education, free medication with best techniques, free food to the poor, I think they deserve a status that in a common man’s perception could be termed as Godly. We drove up Nandi Hills on the way back but the gates were closed at the top. They close at 6:00 PM. But the drive up was nice as we viewed the city lights appeared gleaming as we gained height. 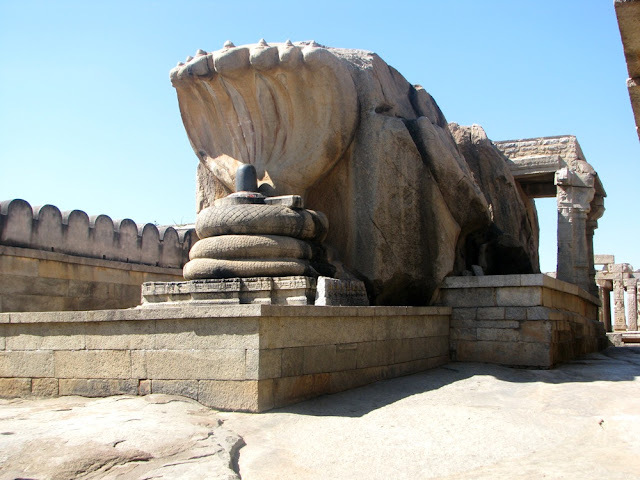 Lepakshi was one big trip to the history, as I would like to see it, a work of art that embodies several emotions, several thoughts, several creativity and many lives. Our next stop was Tandaga (From Turuvekere to Tiptur take left at Doddagatta). 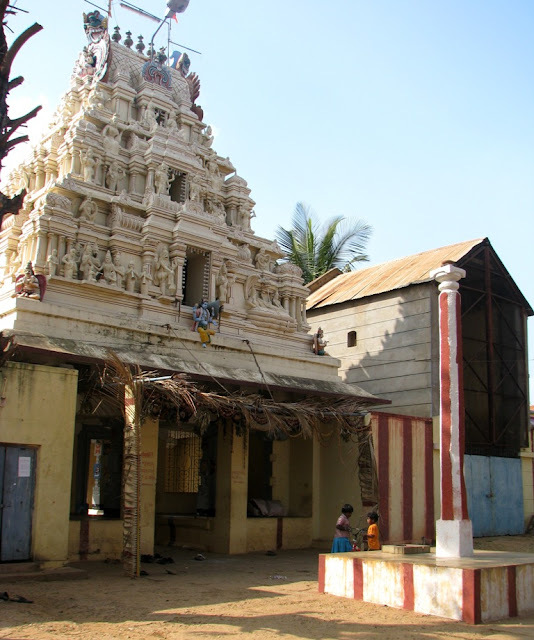 Here a Venugopala temple stands midst a crowd of houses surrounding it, carelessly like one among them with the Hoysala architecture being the only saving grace to distinguish it from the settlement. Two old ladies who watch us observe the exteriors, inform that the priest and his family have gone out and hence they did not have the keys to open the temple for us. So we watch the architecture from the outside before driving away. We reach Turuvekere and visit the Sugarcane juice vendor again to verify about a good vegetarian hotel in the vicinity. He promotes us to the only Vegetarian hotel in the town that served rice-Sambhar, Pulav, Chapathis and other breakfast items. After lunch we drove to Sampige (From Turuvekere to Chikanayakana Halli take right towards Sampige) where a beautiful idol of lord Srinivasa resides. The temple was opened by a priest who performed pooja and offered us Prasad and demanded something in return for it, we handed over Rs20 (Only, I presume), so he requested to pay the lady who offered flowers also (Which should be his wife I assume since they walked in together and said that they had just finished their lunch),the whole episode was a little strange. 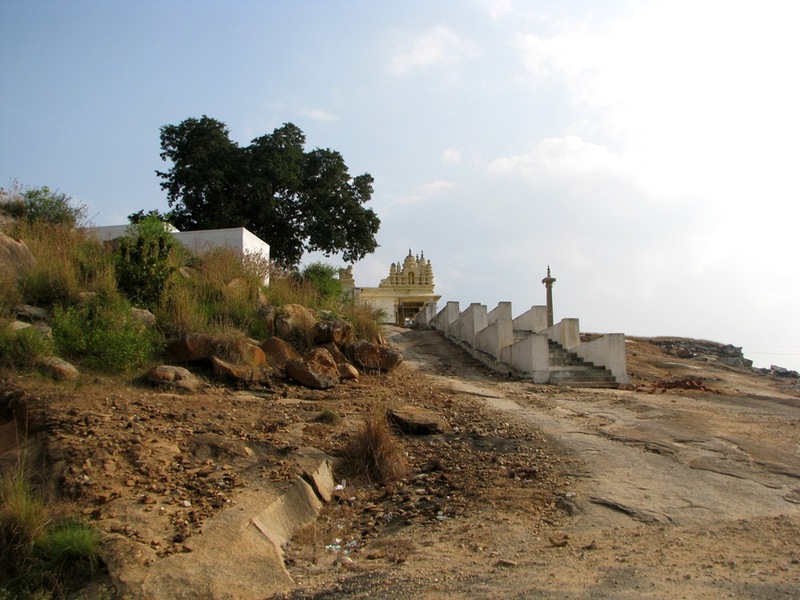 Kanchiraaya Swamy temple is on a hill near Neeragunda. (From Turuvekere to Chikkanayakana Halli take left at Manchenahalli cross). Several hair pin bends and almost 90 degree elevation roads lead you to a quite the quiet and deserted temple. The view from the hill is very nice but the temples are not very neat. A little walk down the hill on the other side leads to a small Shiva temple. After a little relax, we drove back to Turvuekere and then to Nagalapura. 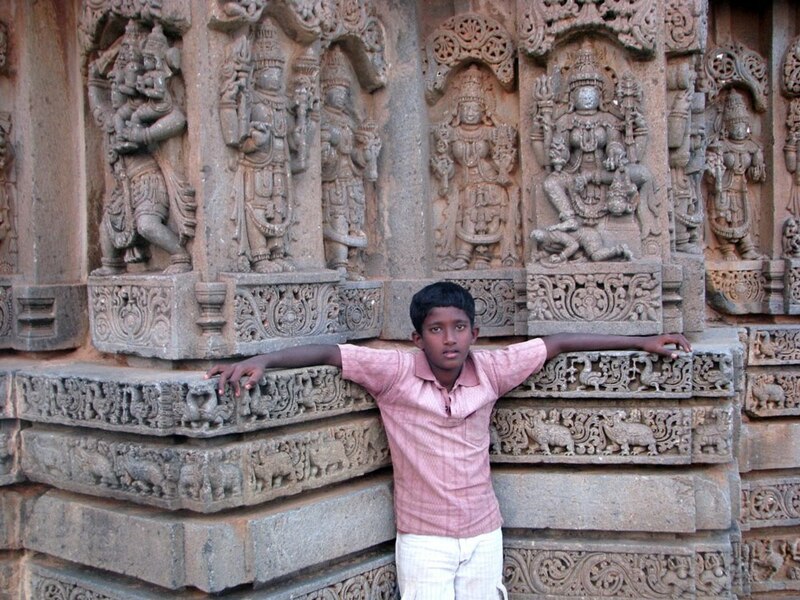 4 Kms on the road from Turuvekere to Yediur is a right deviation to the village where two temples – Chennakeshva and Kedareshwara temples quietly await humans to admire them. When we reached the village and asked for directions, a small boy named Shankar offered to join us and guide us and so began a journey of its own that made the whole trip a memorable one. Shankar knew everyone in the village. He went to a neighboring house and collected the keys to open the Chennakeshava temple for us. He even turned guide to narrate us some stories that had some truth, some exaggeration and some mistakes such as – Chola’s built this temple. But other stories like – Temple was covered by mud when there was an attack, temple was built in a day, Chola’s came from other state, threw stones from a hill several kilometers away etc had a source in his grandfather, so he said. After admiring the architecture and his talent of attracting people with the power of speech, we drove to Kedareshwara temple. Unfortunately it was closed. But he said that the watchman lived in a neighboring village about few kms away. So I agreed to drive there with him. On our way he told stories from his school, his bicycle, his interest in Kannada language and the marks he scored in his subjects. In this other village, again he walked to the watchman’s house, introduced himself but found out that the watchman had gone to another village for an “Aradhane” (death ceremony). But to our luck, there was another key in the same village, one that waits in a house for the priest who collects it every morning at 5:00 AM. This time Shankar wanted me to join him, as he predicted it would be easy to obtain the keys with elders around and he thought his request could be discarded being thought less of importance due to his age. At this house the villagers were uncomfortable to give the key that belonged to the priest. I convinced them that I could return the key to them within an hour. They agreed but wanted us to check with the watchman first. They requested us to call him and find out if he was around. We walked back to the watchman’s house were ladies informed that his cell phone would not connect either. They requested us to go to the village he was visiting. So we drove again to track him down. But luckily we did not have to go any far; at the temple he sat waiting for us after receiving a call from his family. He informed us that he had come down from the Aradhane just for us as he received the call from his family stating our desire to see the temple. We offered some money to the Watchman and thanked him for coming over just for us on a Sunday. We took Shankar to a shop and bought him whatever he wanted – Chocolates, juice, sweets and chips. The shopkeeper was also happy with boy who had actively interacted with us and had also brought business to the shop. Shankar asked us our names and registered them in his mind. We waved good bye to the boy and drove back to Bangalore content with the entire trip especially the final episode that completed all that I look for in a travel!